A smooth trip into the city from the western suburbs and outwards again towards Albert Park on the tram, albeit not the first packed tram, but one arriving soon after that was a bit roomier. I hear that some people had hassles coming in via Punt Road, but that's another story. Inside the social club, a small gathering of South members and members-to-be gathered to collect and pay for memberships. Some of us also try the food on offer in the social club, which now that I've sampled a couple of things on the menu, can justifiably say that the offerings are certainly more than a mere a cut above what was on offer last year. Whether the crew operating the social club space can adjust to the different demands of a match day - where punters will demand speed and probably a lower price line - remains to be seen; but as a more traditional bistro space, I haven't got any complaints yet. ... and rain to the right. Photos: Paul Mavroudis. Outside, fortune of fortune, there was a friendly on. What magnificent serendipity. And soon the good guys were 2-0 up, and looking sharp, well, at least sharpish. Then our esteemed merged, de-merged, and merged guests, who have been through at least three of the four stomachs of the ruminant and much famed Victorian Italian club merger flowchart, pulled a goal back, thanks to some sloppy marking. So it has been from what little I have from this pre-season, where whatever adequate play has been manufactured going forward, just as much inadequacy has been found going toward the other, less desirable direction. Manningham pulled it back to 2-2, Will Orford scored a belter of a goal to make it 3-2 - he dispossessed an opponent in midfield, and curled a shot in from distance over an out of position goalkeeper - before the visitors made it 3-3, after which the scoring ended. The members of the crowd who were there to support Manningham - recently promoted from State League 1 to NPL2 - got very excited with their goalscoring exploits, perhaps unduly so for pre-season; but since I spontaneously rose from my seat in excitement after Orford scored his goal, I guess there's limits to how much I can chide them for their enthusiasm. 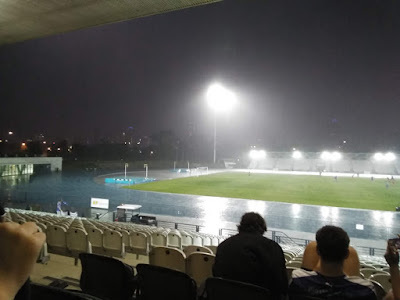 The rain bucketed down, the ground became sloshed, players lost their footing and their positioning, and made frequent errors in passing the ball. I'm not sure what anyone would have learned from the exercise to be honest, and well before the end of the contest, the benches of both sides were cleared, and those still playing were left to duke it out in the pouring rain. You People™ asked for an unapologetically big, gnarly, traditional centre-forward, and you've got your wish. And bonus points, he's Greek, which fits in with one of the themes of our off-season recruitment strategy, that being "need more Greeks" - not that there's anything wrong with that. 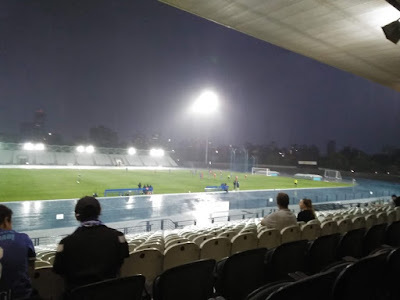 As the official site's blurb says, Billy Konstantinidis is a Melbourne centre-forward (no visa spot required) who has spent the better part of the last decade and a bit playing for several lower league teams in Greece. Though if you trust Wikipedia, and who doesn't, Billy hasn't been playing or scoring much in recent seasons. And here's some bonus trivia - Billy, who turns 33 in April, played in East Richmond's last season of senior football in 2004, which is a hell of a long time ago on a number of fronts. Now I don't know how fit Billy is and whether he's ready to go from round 1. Much the same however can be said about some of other players who have had injuries, but especially Marcus Schroen who has missed a good chunk of this pre-season with trips to Cambodia (late last year), and apparently now Sri Lanka. Combined with that, there has been that much rotation of squads during the practice games that I honestly have no idea what Con Tangalakis' best starting eleven is. Chances are that whatever lineup Tangalakis chooses to field against West Adelaide on Saturday will probably be close to the starting eleven which will take the field against Bentleigh in round 1. But back to Billy Konstantinidis, who has been touted by the club as the team's last signing before the start of the season. That statement means the categories I've used to keep track of who's in, who's out, and who's been hanging around, have had to be reshuffled. One wants to trust the announcements about players signed, and players gone, but the great mass of those in the middle remain problematic. So I've decided to sort them into two groups one being players who were at Lakeside last year and at pre-season this year and thus likely signed up, and a handful of others whose status is more tenuous. There's more than 20 players in the list, so I'm assuming at least a few will end up in the 20s. Seen hanging around pre-season training and buggered if I know what their signing status is. I'm not going to say that I don't even care if we get relegated now, but let us all appreciate this moment. For years I have argued that we need these as opposed to the bland, pompom-less beanies, and finally after many years of griping, it's happened. Kids will love 'em, they look good, and they have character goddammit. Why other tinpot local clubs could have these things and we couldn't I never found out, and now I don't even want to find out. They cost $25, and five of those dollarydoos end up going to the South Melbourne Powerchair team. It's several levels of win. Yet another marker of a season that's almost here. It's all standard procedure these days, a long way from the days of being told that what I did was entertaining, but not important enough to have a media pass. I never take it for granted though. I added details for Paisley Park and Frank Holohan Soccer Complex to the guide, not that anyone cares, and not that anyone will bother, possibly not even me for Frank Holohan because it is such an insane trip.